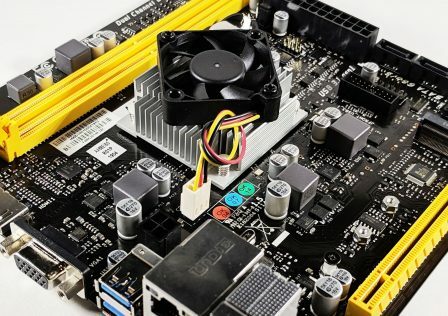 The first thing that comes to mind when you consider the Level 10 lineup from Thermaltake is Design. Level 10 products have had a history of having a certain uniqueness to them that separates them from the rest. With that being said, the Thermaltake Level 10 M gaming mouse from Thermaltake is absolutely no exception. Its sleek and complex design is the product a design team who work for BMW. Not only does this thing look top-notch, but it has the construction to back it up. The base is made out of thick aluminum, and the top portion is a hardened vented plastic. And like any good quality gaming mouse, the cable is braided. But what about customization? Well, if this is your thing, then you will not be disappointed. The Level 10 Mouse has more customization options than we have ever seen in a mouse. Each of the 11 buttons is fully customizable to any operation you need via the included software. Not only are the buttons customizable, but each individual light can be changed to a specific color, or turned off. And in addition to that, the physical size of the mouse can be changed. Using the included hex-wrench, you can change the height and angle of the top portion of the mouse. So with all of its features, which we will get into later on in the review, you can bet that this mouse is about as high end as you can get. And you get all this for an MSRP of $99.99. There are also four color options for you to chose from: Diamond Black, Iron White, Military Green, and Blazing Red. In this review we will be looking at the Diamond Black version of the Level 10M. On paper, this mouse appears to pack just as many features as you’d expect from a mouse that looks the way this does. In a nutshell, you get seven programmable buttons, a massive resolution of 8200 DPI, and a design like no other. That being said, lets take a look at some of the features and specs. 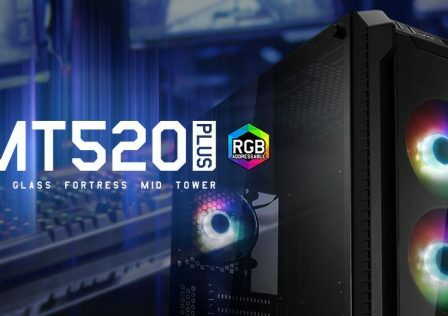 This information was provided by Thermaltake’s website. Level 10 M Mouse is a programmable gaming mouse capable of using the most comprehensive software application to customize settings based on gamer’s needs. 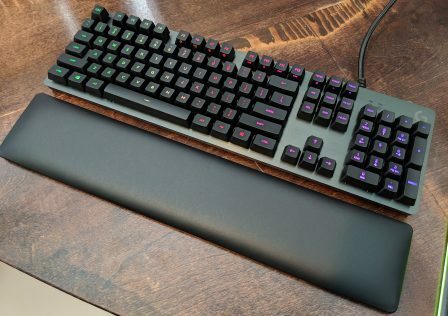 Specifically, the Z key can be programed to switch up to 5 gaming profiles. 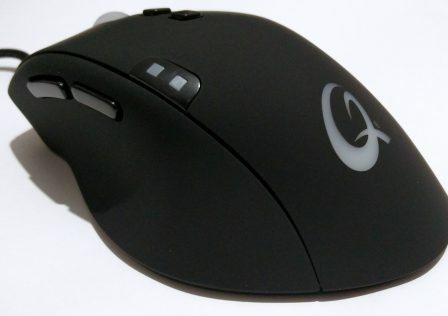 Other features such as the polling rate and the 7 lighting-effect colors are also customizable through software, making Level 10 M Mouse a truly amazing mouse for pro-gaming and creative needs. Aluminum base is one of the toughest chemical materials with character of high resistance to corrosion, and commonly used in aerospace industry and architectural purpose. Level 10 M Mouse is designed with solid aluminum material to ensure both durability and tenaciousness are constantly experienced by the users over Level 10 M Mouse’s quality and long-lasting durable experience. Now that we’ve got a better overall understanding about the Level 10M gaming mouse, lets take a closer look! To begin, lets take a look at the Level 10M’s packaging. 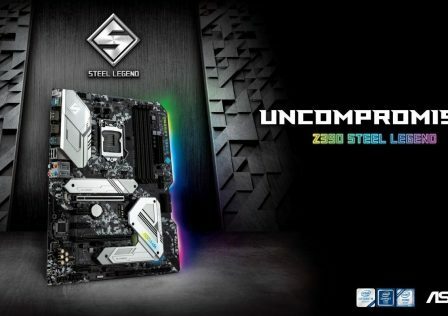 At first glance, the packaging is similar to the rest of Thermaltake’s Tt eSports design. It’s attractive and does a good job featuring the product. Upon sliding off the cover, you find a very nice display featuring the mouse. The way that Thermaltake designed this box, they really did a good job at making you feel like you are unboxing something of extreme importance! The housing that the mouse sits in removes and you have all the extra goodies stashed below. These include warranty/instruction manuals, a custom carrying case, and a hex wrench for adjusting the angle and height of the mouse. A carrying case is always a nice touch. 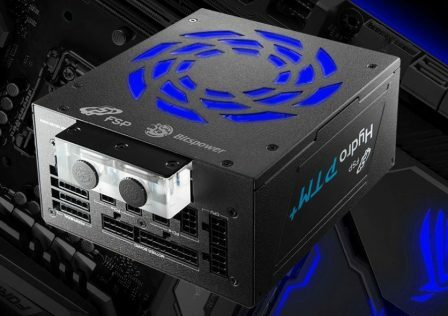 It seems with any Tt eSports gear it comes standard with them all, so naturally Thermaltake would provide us with one considering that it doesn’t get much more high-end than this. The included hex wrench comes in a nice little custom foam case. This is used to adjust the angle and height of the mouse. Now, lets finally move on to the star of the show! As you can see, the design is definitely unique. The entire bottom portion of the mouse is made of of thick aluminum, while the top is a hard plastic. This gives the mouse a very solid feel. Perhaps too solid? The problem with all this construction is that it adds a lot of weight so moving a (heavier) mouse such as this around for hours on end, may be uncomfortable for some people. Another thing worth mentioning is the size. This is by no means a small mouse, so if you are a “claw” type mouse user like myself, this may take some getting use to. But, I did find that the ability to change the height of the mouse was very handy when it came to reaching my “ultimate comfort zone.” But overall, no matter what kind of mouse you’ve been using, switching over to the Level 10M will require some getting use to. After about 3-4 days, using this mouse became second nature. Here is a look at the side of the mouse. On the left side there are two programmable buttons, and probably the best way to describe the third button is a joystick. It has a left, right, up, down, and press-in functions. Each of these are programmable, but by default, a press signals a profile change, and the left and right adjust your DPI. The right hand side has two buttons in pretty much the same configuration as the left. 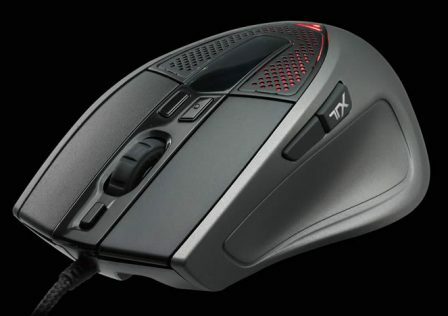 If you are a lefty, this mouse is probably your best bet at getting a shot at thumb buttons! However, for the right-hander, they are pretty awkward to press. I found that as I was learning to use this mouse, I would accidentally press them quite often by just moving the mouse around the mouse pad. By default these buttons are not assigned to anything, which is probably a good thing for the first few days! The Level 10M mouse’s cable is housed in a braided nylon sleeve for increased durability. The USB connector is probably the most unique I’ve seen. This should make it easy for identifying the mouse from the back of the computer case. The ability to adjust the shape of the mouse is a very nice touch which you don’t find very often. The mouse came with everything adjusted right in the middle, but by tweaking the height and angle I found the mouse to be even more comfortable. But, looking at the overall picture, this is a very large mouse. 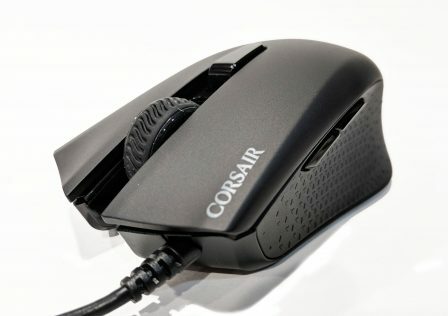 If you have small hands, or a seasoned “claw style” gamer, no amount of adjusting will make this mouse comfortable for you. The best thing you can do is just to use it, and adjust by becoming accustomed to its larger size. To change the height and angle of the mouse, use the provided hex screw driver shown in the images below. Overall, I am exceptionally pleased with the craftsmanship and the level of detail that Thermaltake went in to the design of this mouse. When you hold it in your hand it feels very solid and I can’t find anything negative with its overall construction. Yes, comfort could come into play, but just like any other high end gaming mouse, it will take some getting use to. Thermaltake’s custom software for the Tt eSports Level 10M mouse was pretty typical of almost any other peripheral software. 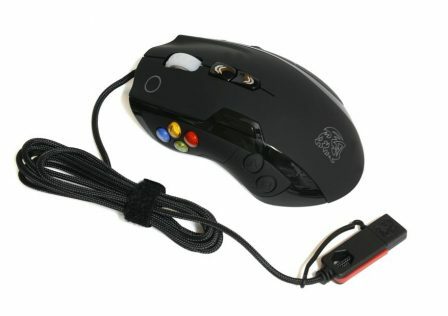 It gives you complete control over all aspects of the mouse which we will go into into detail later. Visually, its layout works and looks impressive. I would have to say that I was most impressed with the Macro area the most. Setting up macros can usually be a pain but this software made it extremely easy. Below we have an image of the main screen of the Level 10M software. You have your profiles listed up at the top, and the four options for accessing different the different features of the mouse. The main screen is also where you set your key assignments. All you do is click on the button of the image of the key you want to change, then select an option from the “Key Assignment” menu on the right. Above the images of the mouse, there is an option for “Battle Mode” bascially what this does is is change the color of the Level 10M mouse’s LEDs based on the frequency of clicks. A cool feature, but does nothing for performance. The lighting menu is pretty straight forward, but unlike most, this software lets you change the color of all the LEDs on the mouse at once, or change them individually. 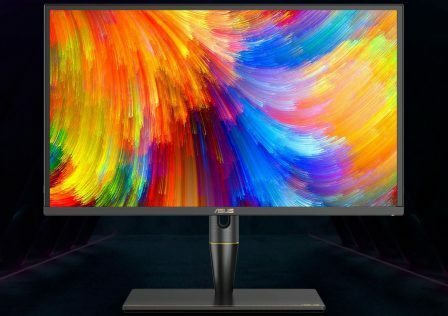 Simply click on the LED you would like to change, and then click on the color on the right. Below is the main screen for setting up your macros. Again, very easy to setup. Simply create a new one, name it, then start recording. There are also custom commands you can choose from instead. The list of commands is also shown below. The performance section allows you to change settings for DPI, double click speed, cursor speed, scroll speed, lift off adjust, and polling rate. The lift off adjustment seems to be growing in popularity with high end lazer mice. It basically allows you to adjust the maximum height you would want your lazer to read when the mouse is physically lifted from the surface. 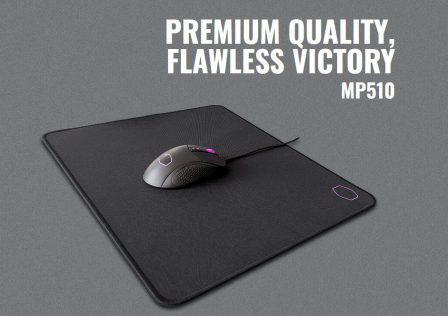 The Level 10M gaming mouse from Tt eSports, is no exception to the rule, “you get what you pay for.” The amount of features bundled with this mouse is incredible, and the level of care which went into the design can be easily seen not just by looking at it, but by handling it as well. The construction is very solid and it feels like something that could seriously handle a lot of abuse. The only negative thing I could mention is that I can guarantee that it will take some getting use to no matter what kind of mouse you are coming from. The overall shape and feel is like no other, but give it a few days of general use, play around with the adjustments, tweak the performance settings in the software, and you’ll never want to go back to your old mouse ever again. Appearance 20/20 -Appearance is always subjective as it usually comes down to personal preference. However, considering the time and detail that was put into the design of this mouse, I think Thermaltake really pulled it off on this one! Construction 20/20 – Yet another area where it was hard to find anything wrong with this mouse.The construction is very solid. There are no parts that move, or flex that are not suppose to, and all of the buttons feel solid. 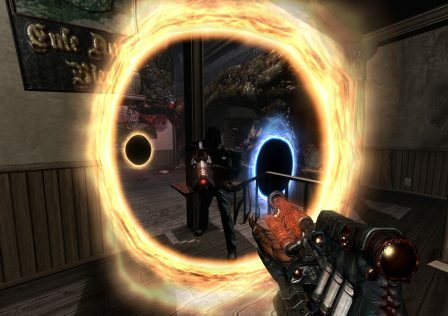 Performance 20/20 – The performance of the Level 10M mouse was impressive to say the least. 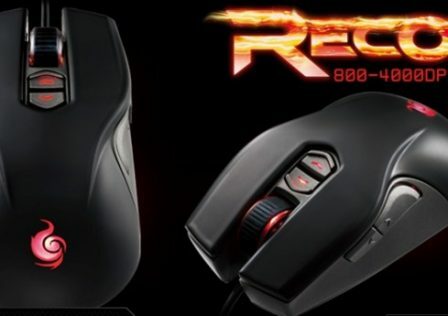 You will have a hard time trying to find another mouse with more than 8200 DPI that can deliver other options such as a 1000Hz polling rate, and lift off adjustment, all configured under five different quick selectable profiles. 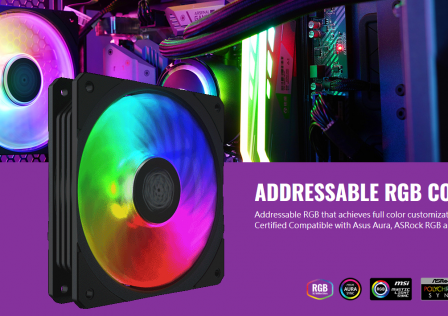 Functionality 18/20 – Obviously the Level 10M is very functional as a high end gaming mouse. The only reason we took off points was for the learning curve this mouse requires. 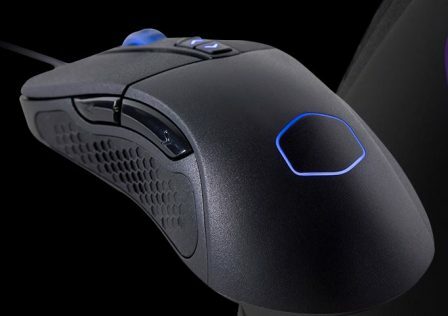 Value 19/20 – The Level 10M is not the cheapest mouse on the market by a long shot, but considering what you are getting in return, we feel that the price more than justifies the value of the product.